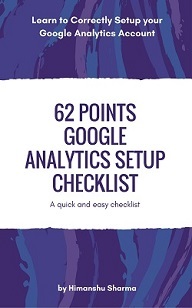 Step-1: Login to your Google Analytics account and then navigate to your main GA view. 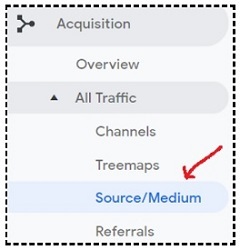 Step-3: Change the data range of the ‘Source/Medium’ report to the last one month. 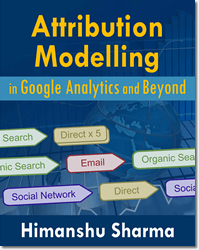 Report on the assisted conversion value because Facebook does not always directly close a sale. Sometimes it may only assisted a sale which is then closed by other marketing channels. 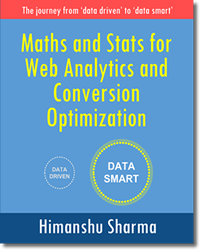 It is important to note that the assisted conversion value for Facebook, as reported by Google Analytics does not take Facebook view through conversions into account. 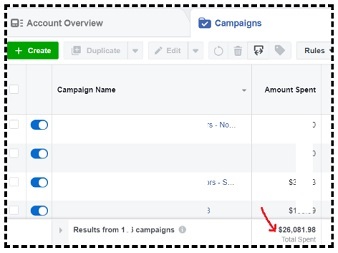 There are no impression assisted conversions reported for Facebook by GA.
You see only click assisted conversions. 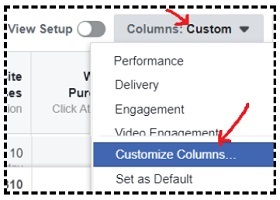 Step-8: Navigate to your Facebook Ad manager account and set the date range to the last one month. 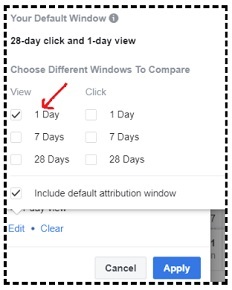 Select the ‘1-day view’ attribution window because it is the narrowest window you can get among all available ‘view through attribution windows’ in Facebook. Note: If all you do in terms of online marketing is Facebook, then select the ’28 days view’ attribution window. 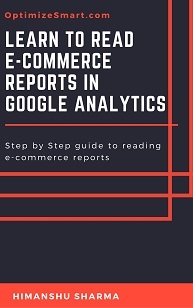 Report on Facebook view-through conversion sales because they are not reported by Google Analytics. Google Analytics can not report on ‘view-through conversions’, as they do not result in a visit that can be attributed to Facebook. All such visits are either reported as direct traffic or branded organic search traffic or traffic from some other marketing channel. Remember that the Facebook advertising is also creating a ‘demand’ for your product/service. And this demand can result in lot more direct and branded organic search traffic and sales on your website. 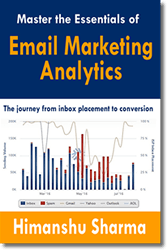 The only way to measure such impact is to take ‘view through conversions’ into account while calculating ROI. 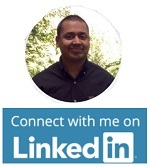 We can not discount them completely and assume they do not exist and have zero impact on sales and other conversions. It is important to note that the assisted conversion value for Facebook, as reported by Google Analytics does not take Facebook view-through conversions into account. Google Analytics does not report on impression assisted conversions (conversions assisted by Facebook ad impressions) for Facebook. 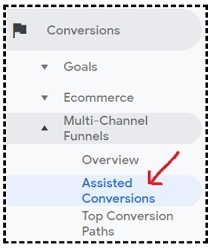 It only takes Facebook click assisted conversions (Conversions assisted by Facebook ad clicks) into account, where people clicked on one of your Facebook ads in their conversion path. Facebook calculates view-through conversions for different attribution windows like ‘1 day view’, ‘7 day view’ and ’28 days view’. 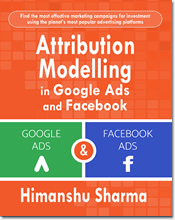 Wider the attribution window, the more conversions Facebook will claim. 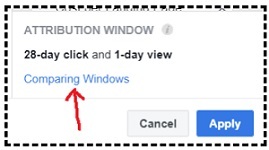 1 day view’ attribution window is the narrowest window you can get among all available ‘view through attribution windows’ in Facebook. 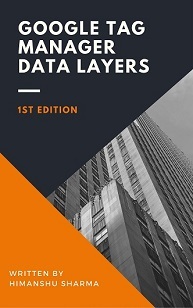 ‘1 day view’ attribution window means, Facebook attribute all conversions that occurred on your website to the last Facebook ad which a person saw (but not clicked), provided the conversion(s) occurred within 1 day from the last ad impression and no other Facebook ad was clicked in the last 28 days. So for every dollar we spent on Facebook, we got $7.77 back. That’s how we can calculate the ROI of Facebook marketing campaigns. 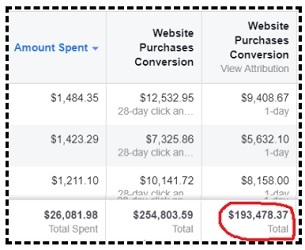 Note: If majority of your website traffic and sales come from Facebook then make sure to use the ‘28 days view’ attribution window (not ‘1 day view’ attribution) for calculating the View through conversion sales from Facebook.